It was a big day this week with the arrival of the first casks into our distillery. Like most distillers, we exploit the legal requirement for US whiskey makers to use new barrels to age their spirit. That requirement means there is a huge supply of once-used casks which still have plenty of flavours naturally present in the wood. In addition to that they've been impregnated with some complex aromatics which have developed over the years in the spirit itself. 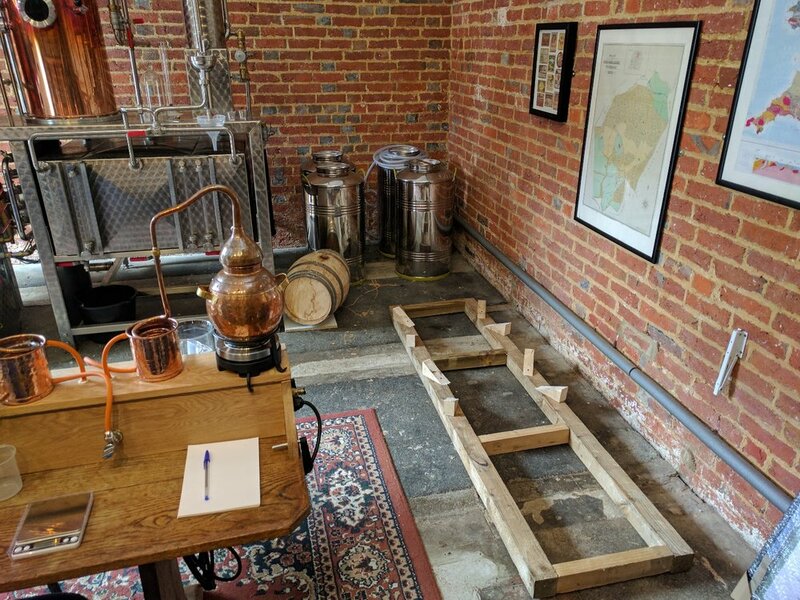 I want to age the majority of my spirit in our distillery - small as it is - and for that purpose I designed the layout of the still house to be able to accommodate barrels along the back wall. You can see in the photo below the area where we'll stack our barrels, with the first row framing in place for the first batch. Barrel maturation is an incredibly complex, and poorly understood phenomenon. It basically involves the addition of flavours from the wood, the breakdown of those flavours and flavours already in the spirit in the presence of oxygen, and the interaction of all of the above. We've filled these first two with Apple spirit we distilled this winter and there it will remain until it is matured well enough for us to begin releasing. We'll age most of our spirits using the solera method, but that's a topic for another day. You can see the little Grappa barrel sitting on top of the brandy barrels on wedges of wood. Its a traditional method of stacking, and the barrels are easily strong enough to take the 250kg weight of each additional barrel on top. Here's what we hope it will look like in a few years - maybe not quite so sparkling clean!